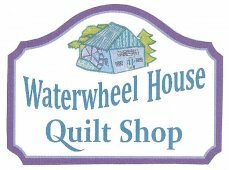 You know we love colorful fabrics here at the Waterwheel House! Any "rainbow order" pattern catches our eye. "Garden Party" is an exciting "one block wonder". 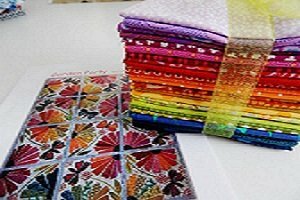 Each 20"x 20" finished block features butterflies and floral motifs that rotate in a rainbow fashion. Splashes of jewel tones, emerald, turquoise, chartreuse, coral, violet, sapphire, tangerine and mustard colored fabrics are fused to several different neutral backgrounds. This is a beginner level fusible applique project, cutting and ironing your fabrics to make each block. You will machine stitch a tiny zigzag with multi colored thread to secure each piece. This is done one block at a time. 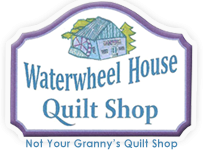 You will have the option of ordering the multi colored thread when you register. The first month you will receive the pattern along with all the fabrics to complete the first block. The Steam- a - Seam 2 Light will be included each month. This fusible product is the best because it is repositionable. Meaning it sticks where you want it before ironing so you can play with your arrangement. 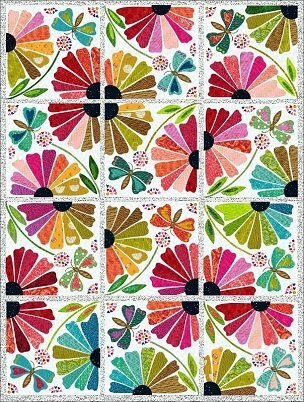 You can look forward to happy fabrics every month! Please call to sign up for this BOM. 802-824-5700. By signing up for this BOM you agree to participate for the full 12 months. We will charge you credit card each month as we ship your installment. Call ASAP as we have a limited number of spots available.